We've made some changes. 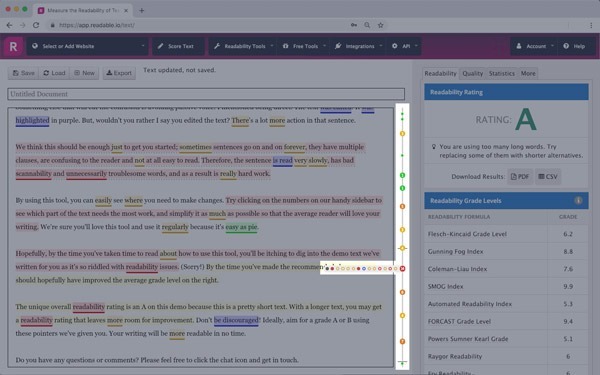 ReadablePro has never been easier to use, and it looks fantastic. Here’s an overview of the main enhancements. 1. Six new readability algorithms! Click on score text in the top menu and you're ready to go. 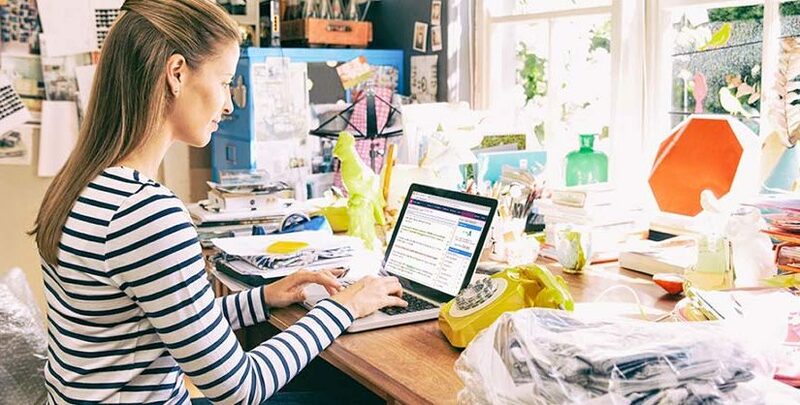 Start typing and start scoring, with minimal fuss. You can even get started by loading demo text from the right-hand column. 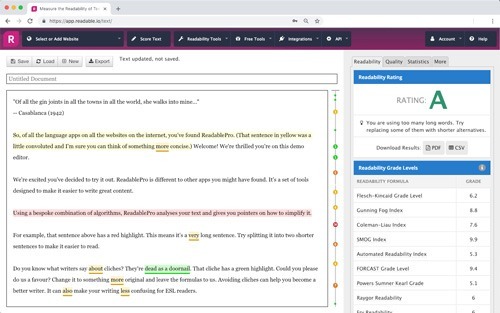 Within it is a snapshot of your text and how each paragraph is scoring for readability. Through a traffic light system you can see how severe an issue is. Red: Lots of work to do. Simply select a sidebar icon and you’ll be taken to that section. Which is easily found in the main text through some nifty highlighting and underlining. Results are more compact, but easier to understand. 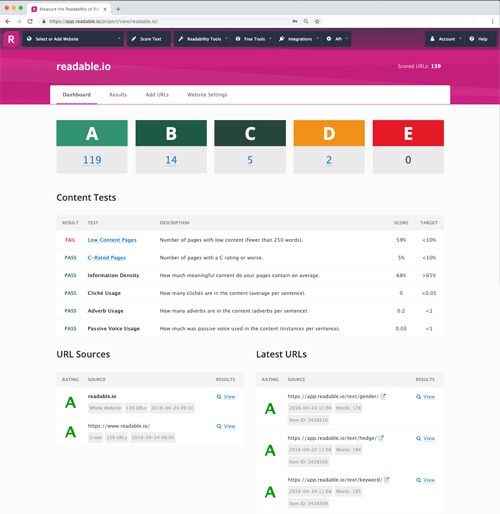 The dashboard loads with an overview of your scores and highlights the good, the bad and the ugly of your website’s readability. This is something we’ve been looking forward to adding for a long time. You can now delete multiple files and URLs, in one go. No more sitting down to a long session of clicking on the rubbish bin and then OK. The readability enthusiasts among you will have noticed that Raygor and Fry are usually based on graphs. We've converted these to algorithms, so you can use Raygor and Fry results in website scoring, file scoring and our readability API. To accommodate these into your readability grade levels and readability scores on the right-hand column, we've simplified the display. As always, we want to know what you think of the platform. What do you love, what drives you mad and what makes you feel indifferent? We can only improve through the feedback you give us, big or small. Dave is the founder of Readable and has been building websites since the early 90s. He’s one of those fortunate people who gets to do what he loves for a living.